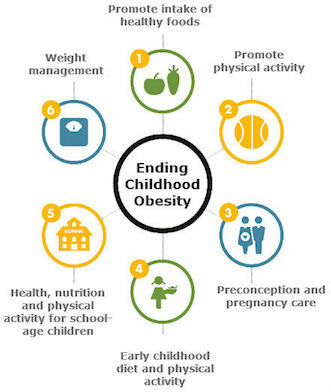 Being overweight as a child increases the risk of being overweight or obese as an adolescent and young adult. In other words, many kids don’t “grow out of” being overweight. Today, about 2 in 3 adults – and about 1 in 3 children – are overweight or obese. Finding out your child’s body mass index (BMI) is the best way to learn if he or she is at a healthy weight. Your child’s doctor can calculate your child's BMI (body mass index) and say if your child is at a healthy weight. It doesn’t have to be 60 minutes all at once – it can be shorter activities that add up to 1 hour a day. Fun and simple activities, like playing tag, are great ways for kids to get moving. Keep inactive (sitting down) screen time to 2 hours or less a day for kids age 2 and older. Screen time is time spent using computers or smart phones, watching TV, or playing video games. Give children age 2 and older water or fat-free or low-fat milk instead of soda or juice. Children under age 2 can drink whole milk.. let him stop eating when he's full instead of when the plate is clean. Plan healthy, affordable meals and enjoy them as a family. When families eat together, children eat more vegetables and fruits and less junk food. Let children help pick out healthy foods, prepare meals, and set the table. Skipping breakfast can make kids hungry and tired, and it may lead them to snack on junk food later in the day. Give your kids whole-grain cereal with fat-free or low-fat milk and fruit instead of sugary cereal. If kids don’t get enough sleep, they are at higher risk of being overweight or obese. Preschoolers need to sleep between 10 and 13 hours of sleep each day (including naps). Set a bedtime schedule and remind your child when it’s time to get ready for bed.